You are here: Home / Strategic Role of Service & Support / Service Recovery / Employees Strike in Support of a CEO? Summary: Employees strike against CEOs all the time, but have you ever heard of employees going on strike in support of a CEO? 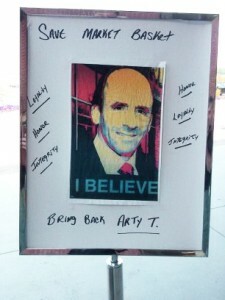 Employees at the Market Basket supermarket chain in greater Boston have done just that in support of Arthur T. Demoulas, and customers are supporting the boycott. This is an odd event. I live in a state — Massachusetts — known for its quirks. And right now we have a really quirky event transpiring. A local company’s employees are on strike because of the CEO. What’s odd about that? They’re striking (or boycotting) in support of a fired CEO. And they’re not union employees, so they could all be fired today with little or no legal recourse. The reaction of the employee base was immediate and strong. Not just store managers, but rank and file employees stopped showing up for work. Food wasn’t getting moved from the warehouse, so the store shelves have become more and more empty, especially of produce. Employees have been collecting petitions outside the stores for weeks on their own time and held mass rallies at the company’s headquarters. All this because the CEO was fired. I should add here that this is my preferred supermarket, especially after they opened a store quite near my house. Before this store opening, I would take advantage of any trip that took me near one of the stores. So, I’m invested in this store surviving, but I’m honoring the employee boycott as is most of the customer base. (Maybe that fact is not so quirky for Massachusetts.) The nearby photo is of a sign outside “my” Market Basket in Hudson, Mass. Unfortunately, the media has only covered the story that makes good headlines — employees striking for Arthur T, the CEO. The media has not really covered any of the back story. Arthur T.’s side of the family is not exactly wrapped in glory, and we haven’t learned what exactly led to Arthur T.’s dismissal. There are rumors of sweetheart real estate deals by Arthur T. Market Basket is a privately-held company so the financials are not public. The media therefore have to work harder to get all the back story. I guess it’s easier to cover employee rallys then really present the whole story. But I have talked with the employees outside “my” store. They say that “Arty T.” wasn’t solely focused on profits. He paid employees well and is the driver behind taking lower margins for the products they sell. The “other Arthur” et al. who fired Arty T. want to drive up profit margins by raising prices and probably being less generous with employees. Of course, maybe Arty’s approach is the real profit maximizing one. Maybe his lower margins have created a hugely loyal customer base, leading to greater volume, and maybe his employee practices mean that customers get a more positive experience, garnering greater loyalty. I recently wrote about a similar story at Hilltop Steakhouse, which went for profits and sunk the company. Maybe if current management gets its way Market Basket will lose its competitive advantage and be less profitable. The nearby photo is of the entrance to “my” Market Basket. All those slips of paper are register receipts that customers have put up from other supermarkets. 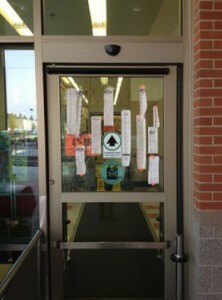 Note that store management hasn’t taken them down or driven the employees from the store entrances. Those who run the company in the corporate offices are an island with little to no support from the employee base, including store managers. Corporate management may win the battle, but it may be of a bankrupt company. As a business school professor, I watch what’s happening in the business community pretty closely. I can never recall a situation quite like this where employees put their jobs on the line like this to support a fired company president or CEO. I’ve never met Arthur T. Demoulas, but the employees all speak about him in very high terms. He certainly has some leadership skills that are seldom seen in businesses — even if we don’t know the whole story. I guess the good news for him is that should he not get reinstated or successfully buy out his cousins, he could go on the lecture circuit. The Market Basket board agreed to sell the company to Arthur T. for $1.5 billion. But this is not the end of the story. How will Arthur T. manage the employees that have backed him so well? He will be hailed as a conquering hero right now. What happens if he has to make a tough decision down the road? At least, I can shop there again. But I’ll wait a week for the likely influx of returning patrons, and I suspect a lot of new shoppers will go there to see what all the hoopla was about. Chats with cashiers confirm that lots of people who had never shopped at Market Basket came to check it out because of all the news. So, the store is more crowded than before. Drats! I don’t think the whole contentious confrontation what an advertising gimmick, but maybe that’s how it’s worked out.